Why we love it: This 2 piece set features a body wash and body cream in an invigorating and refreshing Eucalyptus and Peppermint scent. The body wash is purifying and calming with a light, hydrating lather. The body cream is fast absorbing and deeply moisturizing as it hydrates the skin with rich Shea Butter, reparative Argan Oil, protective Kukui Oil and anti-inflammatory Vitamin E.
Body Cream: Aqua (Water) with Fucus Vesiculosus (Bladderwrack Seaweed) Extract, Caprylic/Capric Triglyceride, Carthamus Tinctorius (Safflower) Seed Oil, Vegetable Glycerin, Stearic Acid, Butyrospermum Parkii (Unrefined Shea) Butter, Argania Spinosa (Argan) Oil, Aloe Barbadensis (Aloe) Leaf Juice, Aleurites Moluccana (Kukui) Oil, MSM (Methyl Sulfonyl Methane), Stearyl Alcohol, Hyaluronic Acid, Glyceryl Stearate, Theobroma Cacao (Cocoa) Seed Butter, Polysorbate-80, Tocopherol (Natural Vitamin E), Phenethyl Alcohol, Eucalyptus Globulus (Eucalyptus) Essential Oil, Panthenol, Xanthan Gum, Allantoin, Mentha Piperita (Peppermint) Essential Oil. 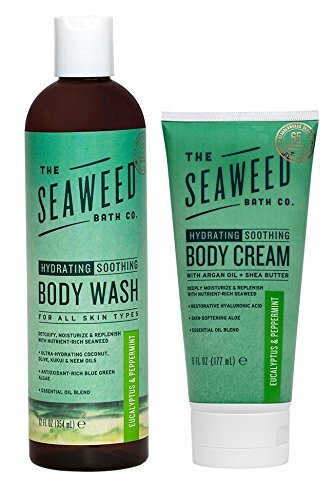 Body Wash: Aqua (Water) with Fucus Vesiculosus (Bladderwrack Seaweed) Extract, Aloe Barbadensis (Aloe), Sodium C14-16 Olefin Sulfonate, Cocamidopropyl Betaine, Cocos Nucifera (Coconut) Oil, Azadirachta Indica (Neem) Oil, Aleurites Moluccana (Kukui) Oil, Olea Europaea (Olive) Oil, Spirulina (Blue Green Algae), Vegetable Glycerin, Castile Soap, Chlorophyll, Sodium Laurylglucosides Hydroxypropylsulfonate (vegetable derived), Decyl Glucoside, Sodium Cocoyl Glutamate, Allantoin, Citric Acid, Potassium Sorbate, Ricinus Communis (Castor) Seed Oil, Eucalyptus Globulus (Eucalyptus) Essential Oil, Sodium Benzoate (natural version), Gluconic Acid (plant derived), Mentha Piperita (Peppermint) Essential Oil, Glycol Stearate, Chondrus Crispus (Carrageenan), Polyglyceryl-10 Laurate (vegetable derived), Orbignya Oleifera (Babassu) Seed Oil.